Well, my piping skills obviously need some improvement, but I was reasonably pleased with these. I didn’t break the bag or shoot the nozzle out of the end for a start, that’s got to be progress. I tried total coverage as well as just a whirl in the middle to see which I liked best. Both CT and I felt that full coverage gave the best effect. They had a delicious gingerbread taste, but had a lighter texture and the ginger was not as strong. Combined with the lemony tang from the ginger and marrow jam, the fragrant aroma and chocolate nuggets, these were real winners; I shall be making them again for sure. Just as well I was giving these away or I might have polished off quite a few of them. That was my friend’s avowed intention anyway. A lighter version of gingerbread with a lemony tang and fragrant aroma. A sweet and spicy bite with the added depth of chocolate. 2 tablespoons marrow and ginger jam. Melt butter in a large pan together with the sugar and treacle. Allow to cool a little whilst I getting on with weighing the flour and chopping the chocolate. Mix in sour milk and stir until smooth. Stir in the marrow and ginger jam. Sift in the dry ingredients and stir to combine. Stir in the chocolate, reserving 24 pieces to place on top. Spoon mixture into 12 cupcake cases, drop in 2 pieces of chocolate on each one and bake at 180℃ for 20 minutes. Turn out onto a rack and leave to cool. Creamed butter with icing sugar until almost white. Beat in 2 tsp lemon juice and the jam syrup. Spoon into a piping bag and using a star nozzle pipe the buttercream onto the cupcakes. Decorate with ginger and chopped chocolate if desired. How elegant! I am just coming to terms with cupcakes, I am usually so late in following trends that they have gone out of fashion and are tiptoeing back in by the time I get there. I like your piping! GINGER! I love ginger so any addition of it in chocolate cakes is a winner for me, and marrow and ginger jam is on my preserving menu this weekend after a kind neighbour left a rather large barrow of them on my doorstep before running away! Those wee cakes look DELICIOUS ~ great photos. They look fabulous – great piping and decoration. I know what you mean about total coverage vs swirl in the centre – I chop and change what I do. 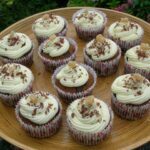 I really like the Primrose Bakery cupcake recipes, I’ve had lots of success with them, and this looks like a great way of adapting the recipe! love the sound and look of these..i’d love to try them..by the way how much baking powder did you use? Jo – thank you. It always gives me a thrill when someone says one of my cakes looks elegant – it so isn’t me 😉 Fashion in cakes may not be your thing, but you’re right up there on the bread front. Karen – he he, have fun with those marrows! Where would we be without spices, it’s hard to imagine food now with none of my favourites ginger, cinnamon, cardamom and chilli. Chele – thank you. I think it’s the piping bags themselves I really need practice with. C – thank you. Yes, I’ve only had successes with Primrose Bakery recipes so far. So you’ve not come down on one side or the other re centre swirl or complete swirl? Janice – you say the nicest things. Hazel – thank you and thanks for pointing out baking powder omission -now rectified. Dom – The ginger must be a reflection of our need to warm ourselves up in all these autumnal gales. When it comes to decorating, mostly I just find it a faff and really, when it comes down to it, I like a cake to look home made. Mmmmm, ginger is one of my all time favourite things! These look lovely and the piping looks fab! I love the decoration, too. I’m always chopping and changing between full cover piping and little swirls in the middle, it usually depends how much buttercream I’ve got; it’s a right pain to run out before they’re all done! Cute cases too, where are they from? It is definitely ginger season – I had some lovely stem ginger loaf yesterday by the sea. The piping looks v good! How lovely – chocolate and ginger is a combination I’ve really grown to love; I didn’t like it at all when I was younger. Kim – thank you. Good tip about how much piping to do depending on quantity. I can’t remember where I picked up the cupcake cases, but the make is “Easybake”. MCB – you are right, I’m seeing ginger all over the net. Eating ginger loaf by the sea sounds fab. Ooh, they do look good, thanks Choc! We’re going through a ginger phase at the moment – we’ve just got hooked on Rochester Ginger Drink! I’ve never had ginger cupcakes before. I love gingerbread and ginger biscuits covered in chocolate so these look good.